After winning their first match TUTI Patriots team is all set to take on Lyca Kovai Kings on Friday, July 20, 2018. In Today Dream11 Fantasy Cricket Match of TUT vs LYC 9th T20I, TNPL, we will cover Fantasy Cricket News, Probable Playing 11, Pitch Report of NPR College Ground, Dindigul, Toss Prediction and Who Will Win? Who Will Win the 9th T20 Match, Between TUT vs LYC and Toss Prediction? Where Can You Watch the Live Streaming of TUT vs LYC, 9th T20I or Channels to Watch? TUTI Patriots have played one match and they have won that match whereas Lyca Kovai Kings has played two matches and they have not won a single match. They have lost one game and one was a tie. According to our astrology prediction, TUT will win the match. The team winning the toss should opt to bowl first as chasing will be comparatively easy on this ground. According to our astrology prediction, TUT will win the toss and they will ask LYC to bat first. 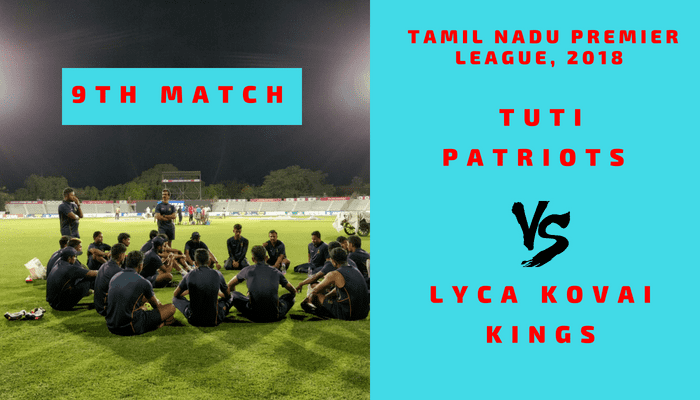 Match: Tamil Nadu Premier League, 2018, TP vs LKK, 9th Match. The wicket is expected to favour the batsmen. The pitch will be batting friendly and the batsmen will find easy to score run on this ground. The bowlers have to bowl in the right areas to take wickets. The seamers will get some initial help from the pitch. The weather is expected to be cloudy throughout the day. The Sun may come out in the morning and afternoon. The cricket fans and fantasy users can see the complete match as no rain is expected. It will be a hot day. The temperature is expected to be 29-Degree Celsius and the humidity to be 58% which may rise up to 69%. In the last two seasons, they have played two games. TUT has won one match and LYC has won one game. In the last encounter, TUTI Patriots have defeated Lyca Kovai Kings by 6 wickets with 9 balls remaining. It will be interesting to see will LYC be able to register their first win today or TUT will make it to two. Kaushik Gandhi and Subramanian Anand are the key performers of TUT. Kaushik Gandhi played a captain knock in the last game. Why fix if nothing is broken. TUTI Patriots may go with the same playing 11. S Dinesh, Kaushik Gandhi, Subramanian Anand, Rajagopal Sathish, Akash Sumra, Umashankar Sushil, Ravisrinivasan Sai Kishore, M Ganesh Moorthi, Malolan Rangarajan, S Abishiek, V Athisayaraj Davidson. Umashankar Sushil (wk), Ashith Sanganakal, Kaushik Gandhi (c), Nidish Rajagopal, S Dinesh, S Boopalan, V Athisayaraj Davidson, Subramanian Anand, Akshay Srinivasan, Rajagopal Sathish, A Venkatesh, Akash Sumra, Shubham Mehta, Ravisrinivasan Sai Kishore, S Abishiek, Malolan Rangarajan, M Ganesh Moorthi, Rajamani Jesuraj, Washington Sundar. Shahrukh Khan, Abhinav Mukund and Akkil Srinaath are the key performers of Lyca Kovai Kings. T Natarajan didn’t play the last match and his playing chances for today’s match is very less. Abhinav Mukund (c), Shahrukh Khan, Ashwin Venkataraman, Antony Dhas, Akkil Srinaath, Ravi Kumar Rohith (wk), Prasanth Rajesh, Pradosh Ranjan Paul, Suresh Babu, Krishnamoorthy Vignesh, T Natarajan/M Raja. Ravi Kumar Rohith (wk), S Ajith Ram, Abhinav Mukund (c), Krishnamoorthy Vignesh, Shahrukh Khan, R Sathyanarayan, Pradosh Ranjan Paul, R Mithun, Akkil Srinaath, Muhammed Khan, Antony Dhas, Suresh Babu, Ashwin Venkataraman, S Manigandan, Prasanth Rajesh, Sumant Jain, J Suresh Kumar, M Raja, T Natarajan. Fantasy Cricket Expert Tips: You can select Ravi Kumar Rohith. 79.47% of the users have selected Ravi Kumar Rohith in their Dream11 Teams and 20.53% of the users have selected Umashankar Sushil in their Dream Teams. Make a combination of the above players for multiple teams. Fantasy Cricket Expert Tips: The above all-rounders are most likely to contribute. Make a combination of the above players for multiple teams. Conclusion: This is it for Today’s Dream11 Fantasy Cricket Match Prediction of TUT vs LYC, 9th T20I Match, which will be played on Friday 20th July. We have covered all the details required to win any fantasy leagues. We have covered players recent and past performance, dream11 guru and crictom prediction, all the latest news and updates of TUTI Patriots Team and Lyca Kovai Kings Team, weather report of Dindigul, dream 11 best teams, keys players, the best choice for captain and vice-captain, where to watch the live match of TUT vs LYC, 9th T20 Match and the details of live streaming of Tamil Nadu Premier League (TNPL), 2018.